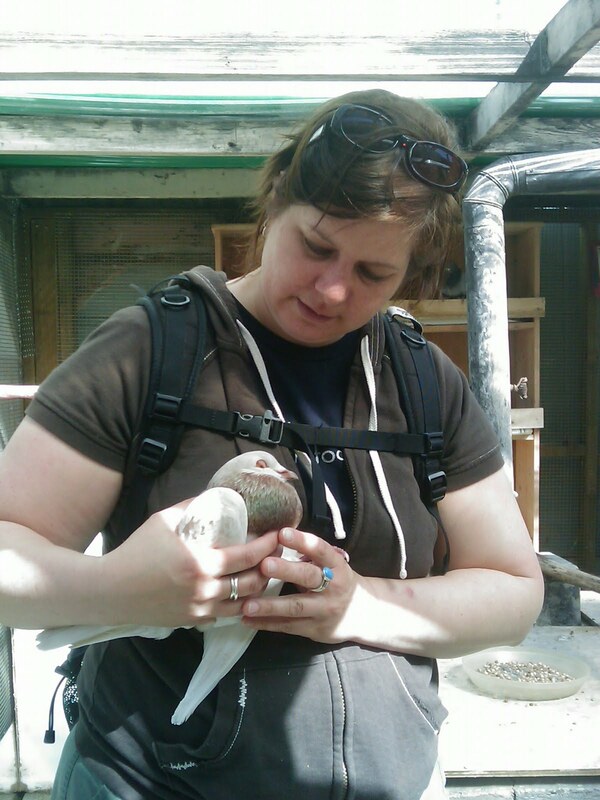 Giselle, as she was named by Michelle, one of the many rescuers involved in helping her, is a lovely young racing pigeon that was found as a stray on 6/24 in SF at Judah and 27th. She's banded but her owner never responded when the shelter contacted him. She was skinny and frail and one of the SFACC Animal Control Officers contacted me- worried that she wasn't going to survive without supportive or vet care. Michelle, an SFACC volunteer and rat rescuer, picked her and brought her to me on 6/28. I was too swamped and busy to take the 40 minutes to go get her myself. Another rescuer, Alice, came to get her the following day so as to provide the level of care that I didn't have space nor time for. And Giselle and I are very lucky Alice did. It turns out this lovely young bird with the incredibly soulful eyes has PMV. PMV is survivable but requires close and supportive care for the duration (which often is 6 weeks or longer). It is a virus that attacks the nervous system and creates motor control problems such that the bird may not be able to feed itself. Torsion (twisting of the neck) is one of the symptoms. As of yesterday, Giselle is "about the same" but holding her own. I'll be visiting her on 7/14 and will update her story as time allows (there is never enough to keep up with the bird care, let alone the bird stories). 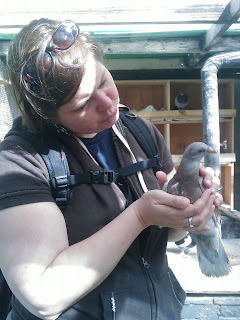 To learn more about other PMV birds that have been rescued, click on these links to read June Bug and Frances' stories. Giselle has made an amazing recovering and is doing great! Her foster mom, Alice, brought her to my place on Saturday for the MickaCoo Fundraiser and she wowed everybody at the event with her beauty and charm. She seemed very happy to join the other pigeons in the outdoor coop (after her long recovery indoors) and took two BIG baths in the first hour that she was out there. I think, while Giselle likes the space and fun of being out in the coop, that she misses her friend Alice. I give her a snuggle and a scritch now and again and I've brought in inside to hang out for a bit but it's not the same, I know.